Inspired by Nikki @ There Were Books Involved, instead of reviewing a book I have chosen to DNF, I will do something more along the lines of a DNF Discussion. Nikki's feature, DNF Q&A, "answers to a few pertinent questions in order to explain what made me ultimately set the book aside." I love how Nikki approached this rare occurrence with a Q&A rather than a full out review and, with her blessing, adopted it as my go-to method for DNFs. So, you added Always, Forever to your DNF pile. How much of it did you read - did you really give it a chance? I did. I read 180 pages, 54%. There were numerous times before I gave that I wanted to DNF and I didn't. 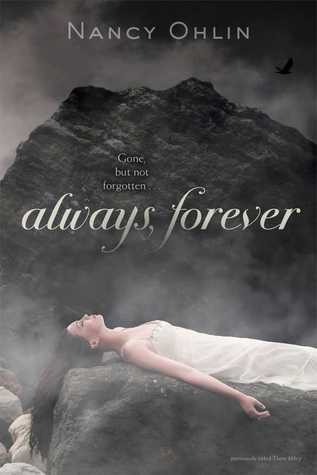 Always, Forever was an easy enough read and slightly intriguing, but I couldn't connect with Tess, the MC, in anyway. Also, her friends were horrible and I found myself rolling my eyes at every encounter with Max. What made you pick up it in the first place? Were you looking forward to it or did it just pop up by chance? I love ghost stories. Love, love, love them. I'm also a fan of the novel it is inspired by, Rebecca by Daphne du Maurier. I was looking forward to it, despite the negative reviews - I'm never one to judge a book based on it's reviews. Did you have certain expectations for the book before starting it? Have you read anything else by this author or in this genre? I didn't have any expectations. I haven't read anything by this author before so I wasn't sure what to expect. What ultimately made you stop reading after 180 pages? Was there anything you liked about the book? I get any teenage girl not being happy with her body, but it was all the time. She wasn't good enough in any sense for anything. Of course, her "friends" didn't help. These mean girls puts Mean Girls to shame. Always on her about her weight (apparently she should only being eating lettuce) and saying she wasn't pretty enough: "She's practically a plus size . . . you look like a hobbit" (142) and then they went on to say they could safety pin this other girl's skirt bigger, wear a shirt that's too baggy on someone else, and use the hairdryer trick to stretch out another's shoes. They frequent/unnecessary jabbing comments got old fast, as did Tess's self-deprecating ones. She immediately likes Max, even after only exchanging two words with him. Then, when he shows interest back, she tries to convince him she isn't good enough? Makes zero sense. Also, every time she thought or was with Max, she was constantly thinking about Becca. I bet he went here with Becca. Does this remind him of Becca? I bet Becca would have been able to do this. I wonder if Becca . . . You get the idea. I didn't understand why she was so obsessed with her. After 180 pages of this going on, along with a so-so romance and dragging plot, I just couldn't read anymore. I wanted so much to like Always, Forever but it just wasn't going to work out. Would you still recommend it to anyone? Hard to say. I never tell people "No, do not read!" Despite the dragging plot, it didn't take me too long to get the 180 pages in. Something kept me reading through the moments of wanting to DNF. Who knows? Maybe it got better in the second half, maybe the mystery really picked up and Tess told those girls where they could stick their "suggestions."